Contexts are execution states for the core LLVM IR system. Modules represent the top-level structure in an LLVM program. Types represent the type of a value. The bulk of LLVM's object model consists of values, which comprise a very rich type hierarchy. A basic block represents a single entry single exit section of code. Functions in this group relate to the inspection and manipulation of individual instructions. 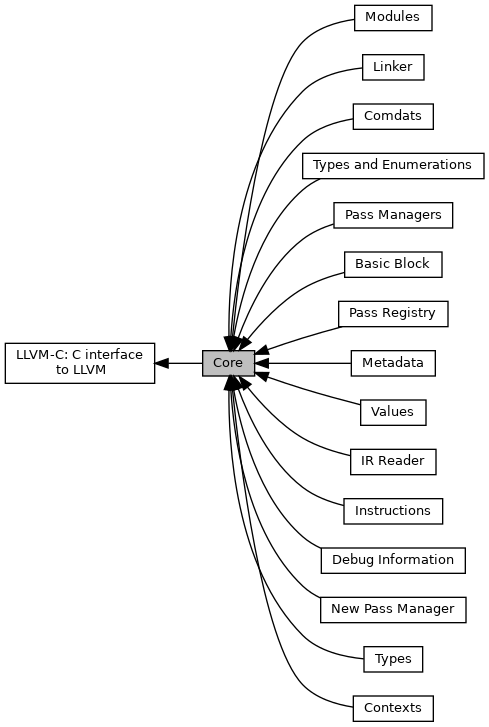 This modules provide an interface to libLLVMCore, which implements the LLVM intermediate representation as well as other related types and utilities. Many exotic languages can interoperate with C code but have a harder time with C++ due to name mangling. So in addition to C, this interface enables tools written in such languages. Definition at line 65 of file Core.cpp. Definition at line 69 of file Core.cpp. Definition at line 55 of file Core.cpp. Deallocate and destroy all ManagedStatic variables.